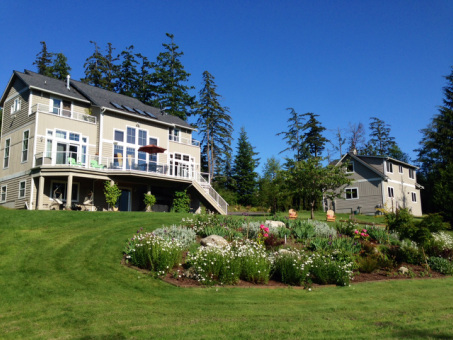 Welcome to Whidbey Island Bed and Breakfast! We are located near the quaint seaside village of Langley on picturesque Whidbey Island. A beautiful hide-a-way, tucked in the trees with lovely filtered views of the Olympic range and Holmes Harbor. An expansive private beach is just a short walk away through our woodsy trails just off of your door step. Our organic gardens are a bounty in the summer and provide for an island fresh breakfast that is sure to please. Each room in Whidbey Island Bed and Breakfast has its own ensuite bathroom, as well as a private balcony overlooking the grounds and stunning views. From your bistro table for two, relax and take in the serene beauty of this wonderful island. A full breakfast is served daily at 9:00 am. Ashlyn is a professionally trained chef who spent years working in restaurants in both Seattle and Spain. 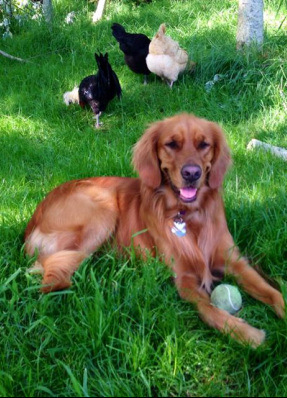 She is happy to support local island farms, forage for seasonal food and use the B&B gardens and chickens to contribute to your breakfast. Tabasco can't wait to greet you! The location is ideal for anyone looking for privacy and tranquility, the home and the property are gorgeous, and the owner made us feel right at home with her care and special touches. We will definitely go back here! The property itself is fantastic with huge gardens, trails all around that lead down to the beach, it's like the Hobbit! I'm almost reluctant to write a review because we want to save this gem for ourselves. Check-In is from 4 pm to 6 pm. ​Check out is 11 am.